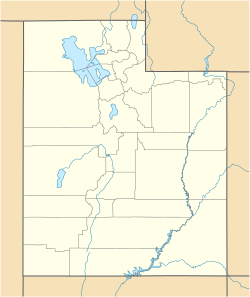 Altonah (also Altona) is an unincorporated community in central Duchesne County, Utah, United States, and on the Uintah and Ouray Indian Reservation. It lies along local roads north of State Route 87, north of the city of Duchesne, the county seat of Duchesne County. Its elevation is 6,673 feet (2,034 m). Although Altonah is unincorporated, it has a post office, with the ZIP code of 84002. Altonah was originally settled in 1906, under the name of Alexander. It was renamed in 1912. ^ a b "Altonah, Utah". Geographic Names Information System, U.S. Geological Survey. http://geonames.usgs.gov/pls/gnispublic/f?p=gnispq:3:::NO::P3_FID:1425097. Retrieved 2008-04-12. ^ "Census of Population and Housing". U.S. Census Bureau. http://www.census.gov/prod/www/abs/decennial/. Retrieved November 4, 2011. ^ Rand McNally. The Road Atlas '08. Chicago: Rand McNally, 2008, p. 103. ^ Van Cott, John W. (1990). Utah Place Names. Salt Lake City, Utah: University of Utah Press. p. 6. ISBN 0-87480-345-4. This article about a location in Utah is a stub. You can help by expanding it. This page uses content from the English language Wikipedia. The original content was at Altonah, Utah. The list of authors can be seen in the page history. As with this Familypedia wiki, the content of Wikipedia is available under the Creative Commons License.